The two-room space is the brainchild of graphic artist Josh MacPhee and his late partner, activist Dara Greenwald. Recent exhibitions include If a Song Could be Freedom … Organised Sounds of Resistance, a survey of the sounds and images of music that accompanies social struggle. 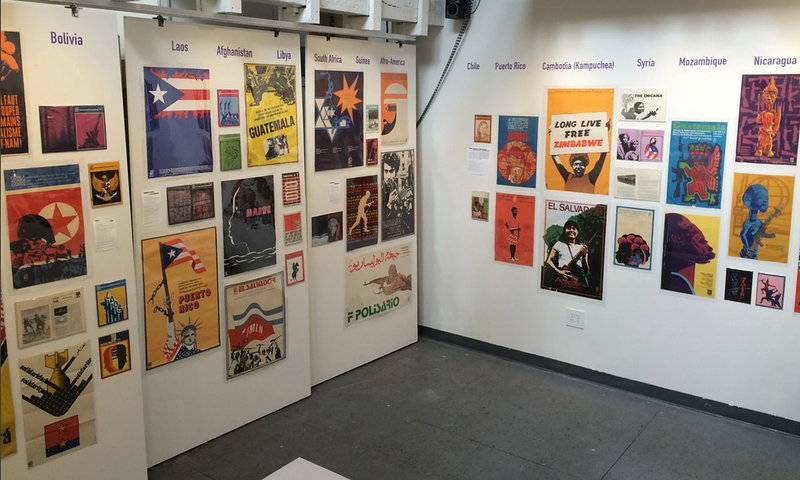 It is currently showing Armed by Design, a comprehensive survey of the graphic art produced for Tricontinental magazine by the Havana-based Organisation of Solidarity of the Peoples of Africa, Asia and Latin America (Organización de Solidaridad con los Pueblos de Asia, África y América Latina, abbrieviated as Ospaal) in support of the global south liberation movements of the 60s and 70s. In conception, MacPhee explains, the archive explores the relationship between cultural production and social movements: in other words, “material produced by people organising to transform the world”. In practice the material is drawn from the progressive or radical left, from the Black Panthers to the Weather Underground as well as dozens of groups and individuals whose efforts are beginning to fade from memory. There’s a small amount of rightwing material from the white supremacist and Tea Party movements gathered, perhaps, in the spirit of keeping an eye on what others are up to. The concept for the archive came out Signs of Change, an exhibition of social movements curated by Greenwald and MacPhee at New York’s Exit Art in 2008. The impetus came from the Occupy movement, which was handicapped by a lack of ready access to knowledge of its political predecessors. The current exhibition is a fascinating tour of 60s and 70s radical politics and its heroes: Amílcar Cabral, the Guinea-Bissauan anticolonial leader assassinated by a Portuguese death squad; Frantz Fanon, author of Black Skin, White Masks; and Carlos Marighella, the Brazilian Marxist revolutionary and writer who contributed the Minimanual of the Urban Guerrilla to literature. For the current show, Interference Archive commissioned artists, many connected to the arts cooperative Justseeds.org, to produce a series of new posters; for the Organised Sounds of Resistance show, a 7-inch single and a series of online mixtapes. The archive’s wealth of books, posters, underground newspapers produced by social movements raises the question: what does solidarity look like today? With a radical pope, the emergence of Bernie Sanders in the US and the rise of Jeremy Corbyn in the UK, perhaps there is some reason for optimism. The conversation may be shifting, concedes Justseeds member and anarchist Kevin Caplicki, but the concept that voting with your dollars is participation rather than consumption is misleading. Interference Archive is far removed from the realm of commercial art galleries, oligarch collectors, the show-palace museums of billionaire real estate developers, and under the watch of gun-toting revolutionaries from several decades back – and is far the richer for it.